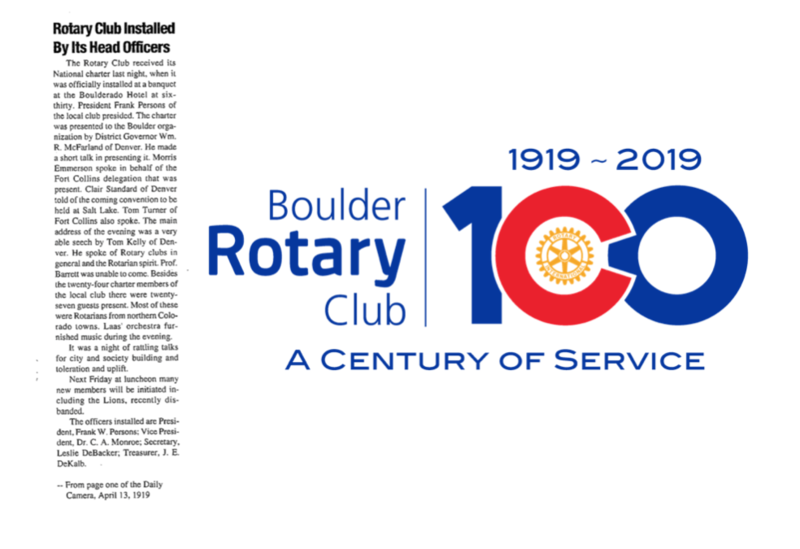 The Rotary Club received its National charter last night, when it was officially installed at a banquet at the Boulderado Hotel at six-thirty. President Frank Persons of the local club resided. The charter was presented to the Boulder organization by District Governor Wm. R. McFarland of Denver. He made a short talk in presenting it. Morris Emmerson spoke on behalf of the Fort Collins delegation that was present. Clair Standard of Denver told of the coming convention to be held at Salt Lake. Tom Turner of Fort Collins also spoke. The main address of the evening was a very able speech by Tom Kelly of Denver. He spoke of Rotary clubs in general and the Rotarian spirit. Prof. Barrett was unable to come. Besides the twenty-four charter members of the local club there were twenty-seven guests present. Most of these were Rotarians from northern Colorado towns. Laas’ orchestra furnished music during the evening. It was a night of rattling talks for city and society building and toleration and uplift. Next Friday at luncheon many new members will be initiated including the Lions, recently disbanded. The officers installed are President, Frank W. Persons; Vice-President, Dr. C. A. Monroe; Secretary, Leslie DeBacker; Treasurer, J.E. DeKalb. This would be a great blurb for the “Round the World” with BRC Cookbook I’m working on. Would you be able to send this (scan?) and other fun facts you have found about BRC’s 100 yr. Anniversary to me? Many thanks in advance, -S.
Thanks for the interest, Sue! Feel free to download any of the files from our site and check back here over the course of the next year as we add additional Centennial Celebration posts.